I learned about the Copenhagen Letter on Tech from my dear friend Eric Reiss. 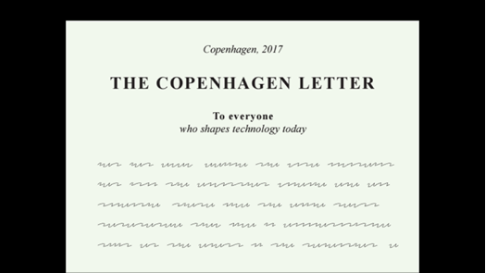 He was one of 150 people, that created the letter during three days of the Copenhagen TechFestival 2017. You can read and digitally sign the letter here: copenhagenletter.org. After reading it carefully, I decided to sign the letter and I hope many will follow and will bring the the topics of the letter into every dsicussion. While I never wanted to stop innovation, I constantly wonder, if actually every new thing, is actually a progress and step to a better world. I question my own work and the demands of my clients, constantly. This letter sums so many things for me up and gives guidance. Yet, it's up to me and you - those who are working in tech and design, to bring the ethic principles to live. For the benefit of humanity. I'm fully aware, that I'm failing constantly on this, but that is not the point. The point is to adopt such ideals, and not others. By the way: If you want more of my take on ethics, power and responsibility, you can take a look through the slides of my talk "Critical Interface Design".